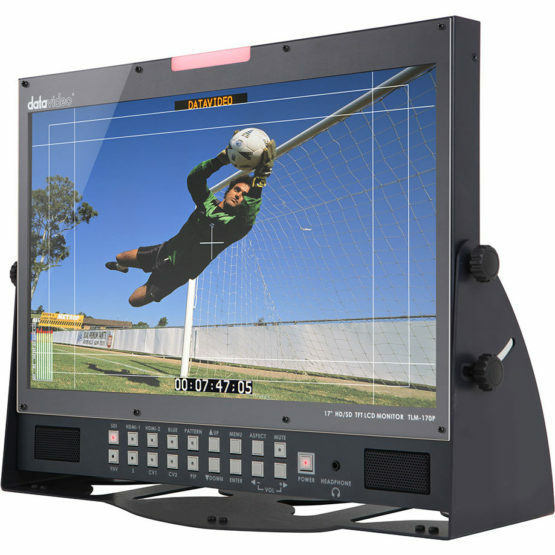 Datavideo TLM-170P 3G/HD/SD-SDI Monitor - Fiber Group Inc.
Datavideo’s TLM-170P is a 17.3-inch, 3G/HD/SD-SDI high-quality reference desktop monitor and part of the TLM-170 series of monitors. The TLM-170P is capable of displaying incredible 1080p video and accepts a wide range of video resolutions. As in all monitors from the 170-series, the TLM-170P is ideal for program output monitoring during production. Amenities like PAL/NTSC Autodetect, stereo speakers w/ audio-level indication & control, safe area mask, and tiltable base are standard.